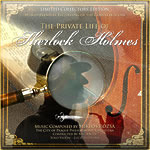 The World Premiere Recording of the Complete Film Score from the Billy Wilder Film of 1970 THE PRIVATE LIFE OF SHERLOCK HOLMES Composed byMIKLOS ROZSA. • Includes "Gabrielle", one of the most haunting themes ever composed for Violin and Orchestra. BONUS MATERIAL includes over 20 Minutes of Music Composed for Scenes Cut from the Final Print of this Classic Billy Wilder Film.